. Alastair Stewart of ITN hosted Prime Minister Gordon Brown of the Labour Party, Conservative Party leader David Cameron and Liberal Democrat leader Nick Clegg as they discussed domestic affairs before a Manchester T.V. studio audience. Nick Clegg, his Liberal Democrat Party, and its manifesto generated many queries as people searched for Lib Dems and Liberal Democrat manifesto 2010. 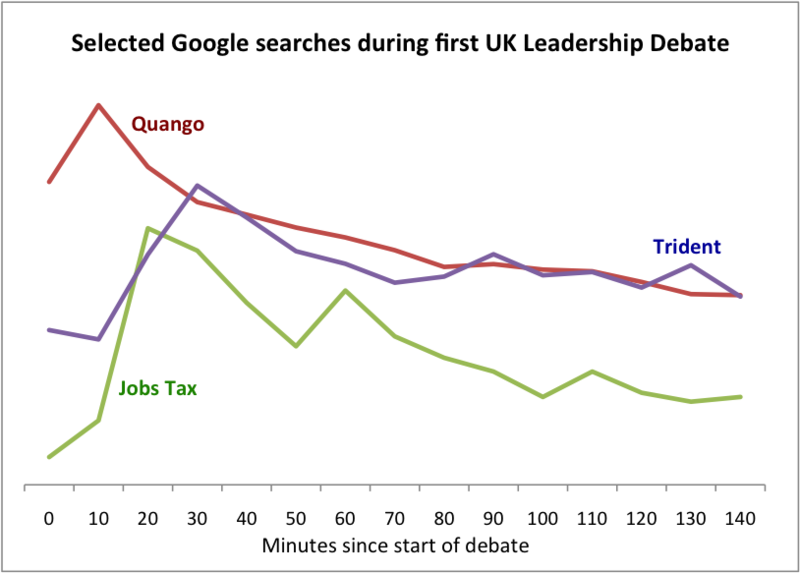 Searches for David Cameron and the Conservatives beat out the well-known incumbent Prime Minister Gordon Brown and Labour, but the two parties’ manifestos generated about the same number of searches. 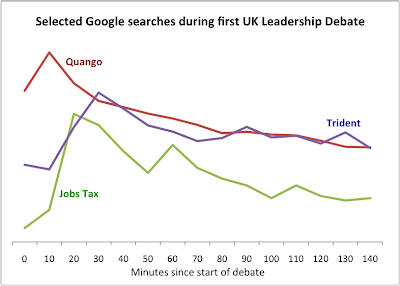 Many Brits sought to watch the debate, searching for ITV election debate and live political debate, while others sought real-time polling information with queries such as debate polls, leaders debate poll and who is winning the debate. Gordon Brown told David Cameron, “I'm grateful, by the way, David, for you putting up these posters about me and about crime and about everything else. You know, there's no newspaper editor done as much for me in the last two years, because my face is smiling on these posters, and I'm very grateful to you and Lord Ashcroft for funding that”, generating queries for Gordon Brown poster and Lord Ashcroft. David Cameron’s statement, “We’re going to get rid of some of these quangos” sent users scurrying to determine what a quango is. Nick Clegg’s repeated railing against renewing the Trident missile and David Cameron’s repeated railing against the jobs tax, a one percent increase in National Insurance contributions, were the other issues generating queries. Overwhelming these debate-related queries was the eruption of Iceland’s Eyjafjallajökull volcano and the closure of British air space. During the three weeks, follow the run-up to the May 6 British general election by watching debate highlights on YouTube and searching web trends using Google Insights for Search. Today, leaders of the three largest British parties took part in the U.K’s first live televised debate in the run up to the May 6 general election. Alastair Stewart of ITN hosted Prime Minister Gordon Brown of the Labour Party, Conservative Party leader David Cameron and Liberal Democrat leader Nick Clegg as they discussed domestic affairs before a Manchester T.V. studio audience.